The tech giant's fourth-quarter report will be a major test of its turnaround strategy. Shares of International Business Machines (NYSE:IBM) surged 20% in 2016, bouncing off a multiyear low as the company made progress transforming itself into a cloud and cognitive computing powerhouse. Revenue and profit are still in decline, with rapid growth in areas like analytics and cloud computing unable to fully offset slumping legacy businesses. But the market is no longer intensely pessimistic on the century-old tech giant. IBM will report its fourth-quarter results on Thursday, Jan. 19, after the market closes. The company has managed to beat analyst estimates for both revenue and earnings for four quarters in a row, although one-time items were sometimes responsible. IBM has been persistent in reiterating its guidance of at least $13.50 in adjusted EPS in 2016. We'll know on Thursday whether it hit its target. More important than IBM's fourth-quarter results will be its guidance for 2017. Revenue has been declining for the better part of five years, and 2016 will mark the third consecutive year of contracting adjusted EPS, despite billions spent on share buybacks. It was never going to be quick or easy to transform IBM, but the market is now expecting a return to growth sooner rather than later. As an IBM shareholder, here's what I want to see on Thursday. IBM will need to produce about $4.91 in per-share adjusted earnings for the fourth quarter in order to hit its guidance of at least $13.50 for the full year. This actually represents growth compared to the fourth quarter of 2015, but IBM's earnings have become more back loaded. Various headwinds that knocked down earnings during the first half, including the mainframe business, acquisitions, and the ramping of the as-a-service businesses, are expected to moderate during the second half, easing the pressure on IBM's bottom line. IBM's software business, which spans growth areas like cloud and cognitive computing as well as legacy transactional software, has posted year-over-year growth for two quarters in a row. This comes after nearly two years of declines, and is being driven by a major pickup in annuity software sales. Software is the most profitable part of IBM, so a return to growth in the software business could foretell a return to growth for the company as a whole. IBM doesn't need to hit it out of the park on Thursday, but it does need to hit its guidance. Any shortfall could quickly wipe out last year's stock gains. Analysts are expecting a return to growth this year, with the average estimate for adjusted EPS currently at $13.79. How accurate this turns out to be is anyone's guess. Changes in currency exchange rates knocked down the company's earnings in 2015 and 2016, and it's impossible to predict what 2017 will bring on that front. The potential trade policies of the Trump administration are another wild card, with IBM operating in nearly every major country. Excluding the things that are largely out of IBM's control, the company seemed to gain momentum in 2016 that could help propel it back to growth this year. IBM's strategic imperatives, which now account for around 40% of total revenue, are still growing at a double-digit pace. With these businesses more software-heavy than IBM as a whole, earnings have the potential to grow faster than revenue. The cloud business is growing even faster. Cloud as-a-service, which includes infrastructure-as-a-service, platform-as-a-service, and software-as-a-service, reached an annual revenue run rate of $7.5 billion at the end of the third quarter, up 65% year over year. With total software sales growing again, the initial pain of shifting to a software-as-a-service business model, which can push revenue recognition into future, now seems to be over. If IBM guides for another earnings decline in 2017, investors will no doubt be disappointed. Analysts are mixed on IBM's prospects: Morgan Stanley and Stifel recently boosted their price targets on IBM stock, while Credit Suisse warned of a potential 30% decline in the stock price this year if the company's guidance is weak. Lackluster guidance could certainly wipe out last year's gains and then some. Strong guidance, on the other hand, could send the stock soaring. IBM stock trades for less than 12.5 times 2016 earnings guidance, a multiple that bakes in little growth going forward. 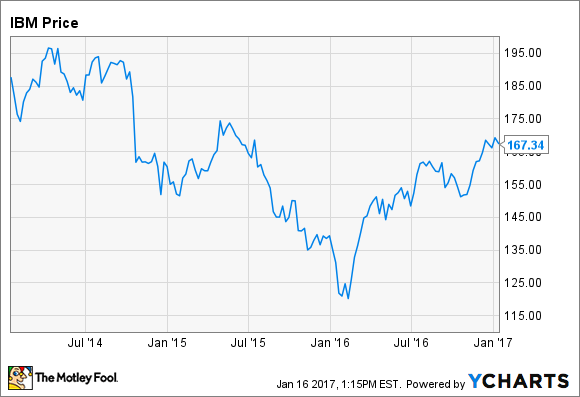 If IBM can prove that its bottom line is finally turning the corner, 2017 could be another great year for the stock.